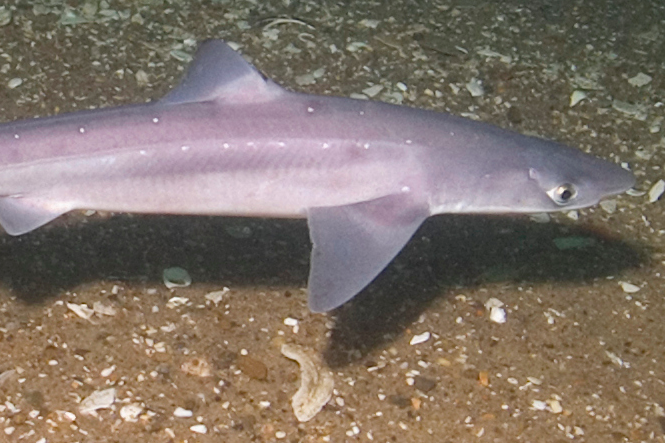 About 60 spiny dogfish sharks, like the one pictured above, washed ashore on Jersey Shore beaches over the weekend. Wildlife officials in New Jersey are working to determine what caused dozens of spiny dogfish sharks to wash ashore at several beaches over the weekend. The state Division of Fish and Wildlife said about 60 of the sharks, which are commercially fished in state waters, washed up on beaches in towns from Brigantine south to Longport, according to the Associated Press. Officials believe the deaths were likely caused by a natural occurrence. One possibility is that the sharks got caught on a salt marsh bay during an extreme high tide. High winds also may have pulled the fish to the beach after the high tide. Spiny dogfish were once the most abundant shark species in the world, but their populations have declined significantly in recent years. The NOAA announced in 2010 that the spiny dogfish stock had been rebuilt in the north Atlantic Ocean, enabling commercial fisheries to purse higher catch quotas. The species can be a challenge to manage because they also pose a predatory threat to other commercial fishing stocks.